Aren't these shrimp beautiful, succulent and colorful? I love making these as an appetizer or a last minute dinner. My boy, the grill and a girl are the perfect cooking trifecta. We believe in deveining and gutting both sides of the shrimp because it really grosses us out. 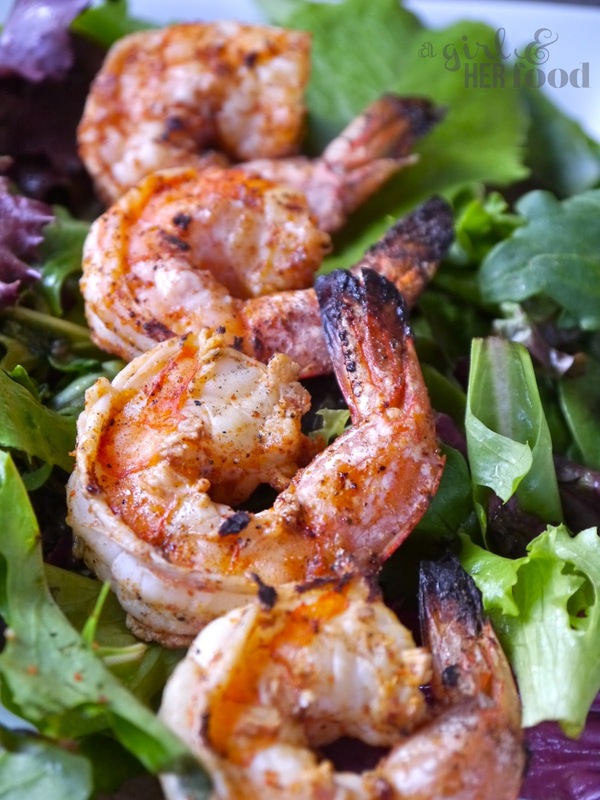 Tony Chachere's Creole Seasoning on both sides of the shrimp and squeeze fresh lime or lemon juice. Let it marinate for about 10-15 minutes. Grill the shrimp for about 2-3 minutes per side or until cooked through. Shrimp cooks very quickly and easily can become overcooked and chewy. Arrange the salad on a plate. Place the grilled shrimp on top of the salad and squeeze the fresh lime or lemon juice over shrimp and salad. Serve and enjoy!